Today, I am taking a break from Speedy Spreadsheet Week to celebrate Telugu New year with my family. Ugadi (meaning start of a new era) is celebrated on first day of Telugu year and occurs in March / April. Just like other festivals in India, Ugadi too has some rituals which are fun & have deep meaning. 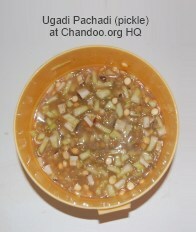 For example, on ugadi it is customary to eat Ugadi pickle – made of different ingredients so that it has 6 tastes – sweetness, sourness, bitterness, salty, hot taste and tang. This signifies life has all experiences – happiness, disgust, sadness, fear, anger and surprise and be prepared (more on wikipedia). Here is a pic from early today morning, when we could finally convince the kids to laugh when the camera clicks. We wish you happy Ugadi and I hope that your life is filled with happiness & awesomeness. PS: Excel Speeding up tips by Experts article will be published on Monday (March 26) and Tips submitted by you will be posted on Tuesday (March 27). May this Ugadi bring you new spirit, new beginning and new prosperity. I am very new to your website which very informative and useful. Though I have completed my 36th year of age but completely 0 in Excel. I want to begin it as a beginner. Can you help me? Wow, it also happens to be my 39th b'day !!! Happy Ugadi to you all too !!! I'll be honest and say that Excel Art version is probably a bit better than mine. Thank you for sharing this day with us. It brought a big smile to my face! 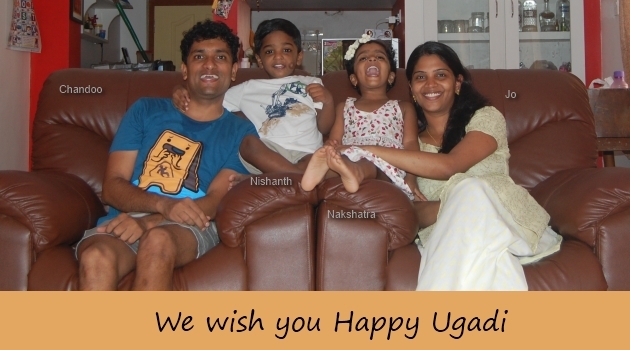 Happy Ugadi…… Good to see ur pic with family….. Happy Igadi to you and your family. Thanks for all. Be happy. Happy New year to you and your family. thanks for share we us. good spirit and prosperity ! i wish you and your family a good life and happy year and i want to thank you so much for your efforts that help us to do best things in excel and more. Looks like you are all having fun! Happy Ugadi! we hope happines and excellence in your professional and personel life..
Ugadi Shubhakamkshalu Poorna Garu meeku, mee familiki.. Thanks a lot for excellent website and its like GOLDMINE really.. Happy Ugadi to you all!!!! It was indeed a pleasure to see your nice picture. Life does not mean business alone. We should enjoy and celebrate our rich and diverse culture. BTW I really enjoy your excel tips. Ugadi Shubhakamkshalu to you all. Thank you as always for the awesome tips. Thank you sir..and wish u the same. I have been recently following your posts and found very handy and useful for new users of excel and professionals equally. Happy Ugadi Chandoo! Thanks for sharing your culture. Wishing you a blessed new era!